The Zodiac Fountain was made by the sculptors Varda Ghivoly and Ilan Gelber in 2011, Character Design was made by sculptor Navot Gil. 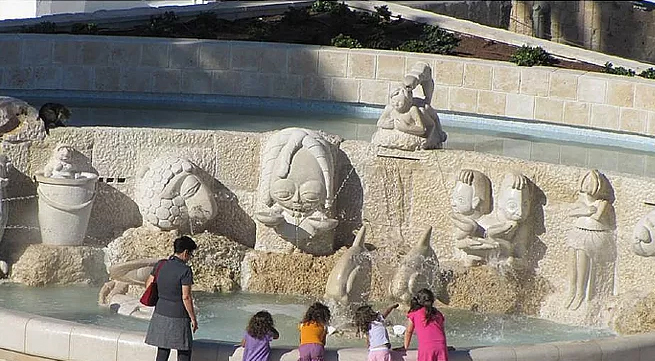 The fountain, located in Kdumim Square, bears chalkstone sculptures of the twelve zodiacs in fascinating, original designs. The fountain combines effects of water, lighting, and stonework, and completes the representation of the twelve zodiacs in Old Jaffa. The zodiacs also appear in the street names of Old Jaffa and the Wishing Bridge connecting Jaffa Hill with Kdumim Square. 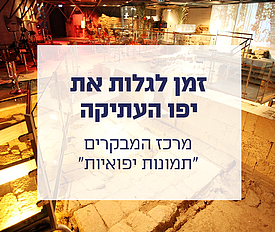 As part of the digging work for the fountain, the Antiquities Authority conducted a salvage excavation at the site. The dig was managed by Mr. Diego Barkan of the Anitquities Authority. The dig exposed architectural elements of the Ottoman period, including remnants of structures, walls and floors, and a tiled yard containing a water reservoir, and constructed, roofed aqueducts. The findings found under the fountain corroborate an old legend mentioning the existence of a magical wishing well located in this very place. Anyone who tosses a coin in it and makes a wish has his wish fulfilled on the spot.